Although it wasn’t discussed in depth, I observe that big data is especially poignant to retailers for two reasons: they have extremely rich internal, proprietary transaction data on customers (loyalty cards, credit cards, returns information, call center information, service information) and retail customers are the most free-wheeling online. Retail customers discuss their experiences in situations in which they use most types of products. This gives retailers priceless information: the social context in which customers are using products to attain outcomes. Eric—Future of retailing in early stages, but it’s a tectonic shift, like the Internet in the 1990s; Amazon is a huge influencer. 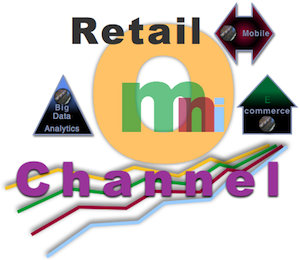 Omni-channel, driven by digital and mobile, is the destination of all retailers. Two key drivers: smartphones and big data & analytics. Retailers need to understand and move, incorporate these into business strategy and business process changes. Mohammad—Here’s a recent example. My wife was shopping for shoes at 9 West and didn’t find anything she liked. As we were leaving, an associate with an iPad approached and encouraged her to browse their entire inventory, complete with customer reviews. She ended up pre-ordering a pair. This shows that physical and online are blurring, even though it’s still early days. It’s a new territory that retailers need to test on their own. Jeffrey—Retailers can build in switching costs with exclusive products and by offering long tail products. 30-40% of Amazon sales are not available in any local retailers; they are long tail products (specific, niche). Retailers [can use omni-channel] to sell excess merchandise, long tail products and mid tail products (not quite as niche but not mainstream). Customers can’t find products in stores. Home Depot enables customers to use apps to search the retail store, to find things. Eric—Now stores get what people want, like ecommerce [because they are finally digitizing]. Amazon never had stores, and it’s different for retailers with stores. Video cameras, digital data and analytics are changing the game for physiical retailers. For example, Catalina Marketing has a solution that delivers personalized ads to customers as they navigate stores. [In effect, it gives the store the same advantages etailers have had.] It’s hightech and high touch. Retailers can counter showrooming with iPads and putting their entire inventory in front of customers. Mohammad—An opt-in solution enables retailers to use video to detect shoppers’ moods and responses to store stimuli. Privacy? Yes, it’s an issue, Nordstrom backed off its customer tracking program this spring after customers got upset that the retailer was using their smartphones to “follow” them around stores. They have to create value to align customers with them (retailer). Erik—There’s definitely a creep factor. Retailers can push restaurant reviews, personalized promotions in stores via smartphones. In-store ads, though, are visible to everyone around customers. For certain products, this could be embarrassing, hemorrhoid creams, etc. There are generation issues. It will require a culture shift. Most people don’t know how much information banks, retail and and NSA already have on them. Organizations with the information need to get permission by creating value propoisitions for customers. Jeffrey—This goes beyond recommendations for existing products; retailers can use digital information to design products that people will like, working with manufacturers. Amazon gets authors to write for them. They can target specific products. Mohammad—Make the store cross-platform. Customers like stores. Erik—Retailers must be truly omni-channel, not defensive, they should embrace all channels, don’t try to hide. Create [customer] experience. It’s not either or. The control of customer data is a hard issue, like Facebook [only worse because data is everywhere]. It’s even more critical in healthcare. Erik—Analytics are the new currency among retailer and manufacturer. Brands can use it to negotiate shelf space. Brands partner with MIT for analytics. Who owns the data?.. the retailer, the manufacturer, the distributor? Erik on the future of retail—Augmented Reality (AR) and Google Glass and Amazon Flow. Mobile and analytics are key now, and AR will be in the future. Mohammad on the future of retail—Exclusive products are key. Consumers have low search costs. Retailers should welcome competition and strive to create real value for customers. It will be a winner-take-all situation. Jeffrey on the future of retail—Product bundling is another potential differentiator because customers can only get that bundle at that retailer. Amazon Subscribe and Save program offers 15% savings [by offering products by subscription]. Amazon Prime increases switching costs. Here are some of my thoughts on these topics; all quotes in this section are from Competing in the Age of Omnichannel Retailing. There’s no there there—because “there” is everywhere. To win in this environment, retailers must dive deep into customer experience. This used to be a marketing slogan, but now it’s a reality. The product channel (getting the product) offers minimal value for a huge and growing portion of customers. Yet most retailers are still product-focused. Retailers can win the hearts of customers by diving into the emotional depths of experience. For example, people shopping for wedding clothes are often excited, upset and tense. The clothes are usually a desire to build or maintain reputation in the eyes of family or (new) in-laws. By looking at customers’ Facebook and Twitter posts, retailers can be more empathic. The cloud can analyze and deliver relevant information to associates via iPad or, soon, Google Glasses, automagically. The technology is not the point; caring is. Technologies are giving physical retail stores many of the advantages that etailers have long enjoyed; however, there is a double standard: most people don’t feel physically threatened by cookies on websites, but they do object to facial recognition and “stalking” in retail locations. This is a simple fact that retailers will have to accept. Trust is the key to transforming retailer relationships with customers. Trust means transformation because the retailer needs to give customer experience a far higher priority than it does now. Consistently. This means relating to people as individuals, at scale. As I argue in Personal Individualized Experience, business is becoming personal, so businesses need to learn how to relate to people personally yet appropriately. Digital social applications are ideal for this. The technologies and solutions to help retailers are proliferating like rabbits. Here are some I’ve encountered. “Manufacturers who supply products to retailers may no longer be able to produce large volumes of the same product for different retailers.” As I have long argued, mass customization will come to dominate. But that doesn’t even address a far more disruptive future, additive manufacturing. I predict that micro-manufacturers with 3D printing shops will change people’s expectations of what a product is. In most categories, products will be personalized. I observe that we are in the post product age. Retailers will benefit from thinking of their products and services in new ways. “Consumer loyalty tends to be higher for ‘experience goods’ (goods whose value can only be assessed after they are purchased) than for ‘search goods’ (goods that can be assessed before purchase based on objective criteria).” The latter are commoditized, almost by definition. However, retailers that know how to differentiate in the social channel can sell “search goods” at high margins because they focus on helping customers to use goods to attain the outcomes they want. For more insights, here is my reflection on The Future of the Retail Store in the Omni-Channel Age. Also see Retail Social Business Opportunities.